This is the first Virago I’ve picked up for a little while, and I was inspired to do so by Liz (her review is here), and Ali has also read along (see her review here). 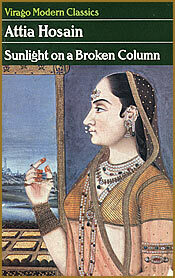 “Sunlight” was Hosain’s only novel and my copy came from on the lovely local charity shops. One of the things I love about Virago books is their diversity – this isn’t a title I would have necessarily thought of as being my sort of reading matter, and yet I found myself completely absorbed. Of Hosain, Wikipedia says: Attia Hosain (1913–1998) was a writer, feminist and broadcaster. She was born in 1913 in Lucknow in a taluqdar background. She studied at Isabella Thoburn College from the age of fifteen and Lucknow University, being the first woman from a taluqdar background to graduate. She moved to Britain in 1947. What’s also intriguing is that she’s the mother of Waris Hussein, who directed the first “Doctor Who” serial – a cool, weird kind of synchronicity, that (I have a bit of a history of a serious “Doctor Who” habit…) But enough of that. “Sunlight…” is set in Indian during the 1930s; this is a colonial India, reaching the end of its existence. The cracks in society are showing, the Empire is fading, but this time the story is from the point of view of an Indian woman, as opposed to the usual white, male writers. Laila, our narrator, is a young orphan, being brought up by aunts in the home of her grandfather. The aunts are traditional and keep purdah, so that Laila’s movements are restricted. Her closest friend is her cousin Zahra, and the women live a very segregated life. But Laila has had an English governess, an education, and is a great lover of books – they are something of a refuge for her. She pushes against the restrictions, questions why things are why they are, and struggles to engage with the political causes of her friends and family, as her own struggles are the most immediate issue for her. After her grandfather’s death, she is sent to live with a more liberal aunt and uncle and is able to attend university. Still fighting for her own independence, she is surrounded by cousins and fellow students who are all involved in one way or another in the fight for India’s independence. As the old world starts to crumble around her, Laila makes her own step away from her family and towards freedom…. This really is a little gem of a novel. It’s hard not to conflate the life of the author with the life of her character Laila, and I suspect that many of the experiences in the book are based on Hosain’s own life. The writing is rich and evocative, and the picture painted of traditional India is vivid, bringing to life the tastes, sounds and smells of the country. It brings alive a culture where so much was invested in the extended family, who lived together under one roof and cared for one another; the nuclear family with its 2.4 children was an anathema. I confess that I was sadly ignorant of the history of India’s independence, and looking up the Partition online was quite an eye-opener. The struggles between the various parties involved in the land and its future were intense and violent, which is reflected in many of the discussions and disputes which take place in “Sunlight”. Pre-partition India, as portrayed here, is a deeply divided place: whether it is by higher and lower class; Hindu or Muslim; East or West; woman or man. The conflicts are sharply drawn, and one of the strongest conflicts is between the generations, with the older, traditional family members completely unable to understand the emotions and politics of the younger. One of Laila’s strongest instincts is for justice – she is unswerving in her hatred of the hypocrisy she perceives, exemplified in the scene where a servant girl (who turns out to be one of her staunchest allies) is beaten for something that a higher caste male is doing all the time. In many ways, the themes are universal – girl rebels against restrictive upbringing; boy and girl fall in love; family disapprove; they fight against the odds to be together. But there are deeper levels, because of the conflicts in Indian society and the massive changes about to take place. The final section of the book is a poignant one, taking place some 14 years later, post-Partition. Laila makes a final visit to her grandfather’s house before it is sold off, and we learn of the events that have taken place. There is a bitter sadness in the disintegration – both moral and physical – which has occurred during those 14 years, and in many ways this reminded me of the scene in “Dr Zhivago”, when Yuri returns to his old home after the revolution, only to find it divided up into makeshift dwellings. The Russian Revolution and the Indian Partition were both cataclysmic events in terms of their effects on people, but does the quest for human equality have to mean the destruction of all that is beautiful? The images of a country being dragged into modernity are shocking and sad, especially when you call to mind some of the pictures we see nowadays of the poverty in India and the conditions in which some people live. One of the strengths of Virago was the bringing together of women from different cultures who had more in common than they might have realised, and certainly “Sunlight” is a bit of a revelation on that score. I found myself returning to the truisms that were bandied about in the early feminist days and realised that they *are* true: women’s struggles are the same the world over, and we are all sisters under the skin. Thanks, Liz, for motivating me to read this book – I’ve even felt the need to pick up the collection of Hosain’s short stories that Virago issued. Truly, she’s a writer we still need to read today.